Chattanooga Whiskey's new Riverfront Parkway distillery, located a former Chevrolet dealership, is seen on Friday, Dec. 8, 2017, in Chattanooga, Tenn. The public can sneak a peek inside Chattanooga Whiskey's new Riverfront Distillery today, since a party will be held from 2-7 p.m. at the facility at M.L. King Boulevard and Riverfront Parkway. "We are extremely excited to finally show the public what we have been up to," said Tim Piersant, CEO of Chattanooga Whiskey. "Since March, we have been producing one of the highest-quality whiskies in the world." 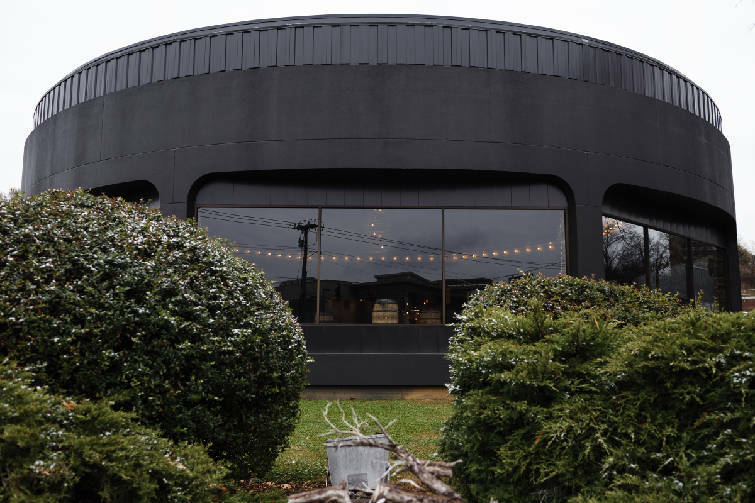 Piersant also is excited about the 5,000-square-foot event space that's been created in a round auto showroom in the former Newton Chevrolet building. The event space, which holds almost 300 people, is for rent, he said. The new distillery dramatically increases Chattanooga Whiskey's production capacity. Up to 14 barrels a day can be made there. But it'll be 2019 before it's released. Whiskey from the new distillery won't be ready right away, because there's a delay between distilling and bottling bourbon. Bourbon must be aged in new, charred-oak barrels for two years, in order to meet the legal requirements for "straight" bourbon. To date, a distillery in Indiana has been the source of almost all the bourbon bottled by Chattanooga Whiskey, which was founded about six years ago. Chattanooga Whiskey has an "experimental" micro-distillery downtown at 1439 Market St. across from the Chattanooga Choo Choo hotel — but it only produces about a barrel a week. While the Riverfront Distillery is open to the public today, Chattanooga Whiskey doesn't plan to host tours there anytime soon. Tourists will visit the micro-distillery downtown, which Piersant said is "ideally located in the Southside." "The Riverfront Distillery is primarily our headquarters, where large-scale production takes place, our administrative and distilling employees are based, and where we can host events upwards of 300 people in the round event hall," he said. There's room in the Riverfront Distillery to store 4,000 53-gallon white oak barrels, which will be placed upright on pallets stacked three barrels high. The barrel storage area isn't climate-controlled, so the bourbon can expand into the barrels' charred interior when the weather's hot, and ooze back out when it's cold, imparting flavor. A number of people raised concerns about the Riverfront Distillery producing "whiskey fungus" when the facility was proposed. It's a black, soot-like fungus that grows on tree trunks, buildings and other objects near distilleries. It's been an issue elsewhere. For example, in 2012, a group of Louisville residents sued three distillers, claiming ethanol emissions caused whiskey fungus to bloom on their cars and houses. Known scientifically as Baudoinia Compniacensis, whiskey fungus is created when ethanol evaporates from whiskey barrels during the aging process — an escape referred to by distillers as the "angel's share" of whiskey. Whiskey fungus shouldn't be an issue here, said Robert Colby, director of the Chattanooga/Hamilton County Air Pollution Control Bureau. "Because of the low volume that they're going to have there, it should not be a concern at all," Colby said. "We did discuss it with them, prior to permitting them," Colby said. "We were interested in looking at that, because of the proximity of new residential construction in the area." Riverfront Distillery is near the upscale Cameron Harbor, one of the biggest residential and commercial projects to go up on Chattanooga's waterfront in decades. If whiskey fungus ever became an issue near Chattanooga Whiskey's Riverfront Distillery, Colby said, "we would certainly be looking at some controls to prevent that." Piersant called whiskey fungus a "non-issue" since the Riverfront Distillery's production will be "less than one one-hundredth" of that at large distilleries where the fungus occurs. "Back in 2012, when we stood before the county commission to change laws, we said we would build a world-class distillery and employ at least 25 people full-time, and that is just what we have done," he said. "That is the real news story here."